Want to know where to eat Fiji foods? Find out here where you can find the selection of restaurants. It will be one of the highlights of your Fiji vacation/holiday. Finding places to eat are largely based around where you are staying. If are on your honeymoon on a isolated island for example, then you are bound by the food at the resort. In most cases, that is more than enough with most holiday makers to Fiji raving about the quality of food. That is the appeal, as you are coming to Fiji to completely relax, and not having to think where to get your next meal. If you are travelling around or taking a road trip, then the main street of the townships are your best bet. Nadi, where you will most likely be flying into, and Suva are the two areas offering the most choice. Along Main St is where you will find most choices. Mamas Pizzas, Curry House, Bulaccino, and Bo Hai Seafood Restaurants are tasty options. Visit our More on Nadi page for the interactive map of Nadi. is your fine cruisine option in the Nadi area. coveted steak and mash was the best he'd tasted in years. Our friends holidaying on Denarau also stated Nadina's was their favourite restaurant. The capital of Fiji offers a diverse range of multicultural food options, with Indigenous Fijian and Indo-Fijian leading the charge. Head along to central Suva along Thompson St-Victoria Pde, near Suva Harbour for the best range. Visit our Fiji Capital Transportation page for an interactive map of Suva. The Bad Dog Cafe on the corner of Victoria Pde and Macarthur St is a trendy option for a drink with popular mains. If you're heading to Fiji's second biggest town, north of Nadi, Naviti St offers options. For those self-caterers out there, markets are fantastic for getting fresh fruit, vegetables, and fish. Most larger townships will have one. 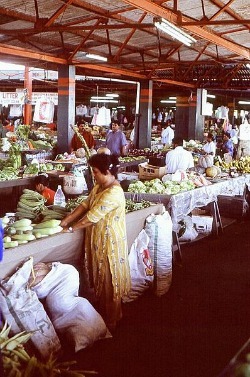 In Suva, the Suva Municipal Market on Usher St is the place to go. A good source for kava, to make your island drink. 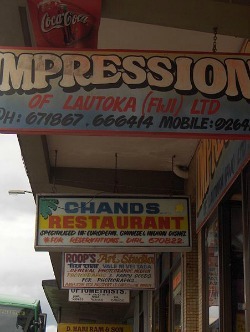 In Nadi, it's on Hospital Rd off Main St.